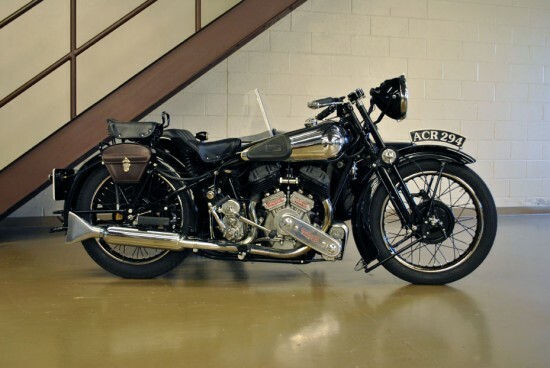 The Brough Superior was the prototypical “superbike” of the prewar era, the “Rolls Royce of motorcycles” in an era when that meant performance, quality, and speed instead of ostentation and ornamentation. They were famous for their ability, and slightly infamous for being the preferred mount and ultimately fatal choice of T.E. Lawrence: he owned seven different Broughs during his life, with an eighth on order when he was killed in a road accident. Built between 1922 and 1940, the SS80 was powered by one of two, outside-sourced engines from either J.A.P. or Matchless, both displacing 1000cc’s and featuring side-valves. 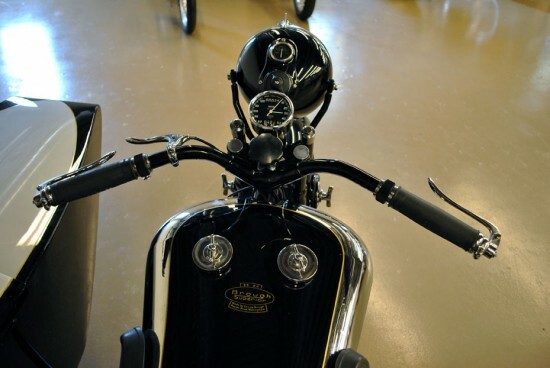 The higher-spec SS100 favored by Lawrence featured overhead valves for additional performance. 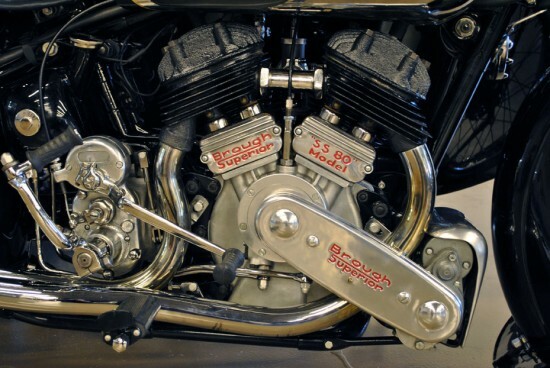 The “80” referred, not to the displacement in cubic inches or cc’s, but to the tested top speed: every SS80 was ridden and certified that it could meet or exceed that speed before it was delivered to its customer. If not, it headed back to the shop until it could. And if it you think it sounds like “to its customer” means that each machine was built-to-order, you’d be correct. This Brough has won best in show at prestigious events such as 2012 Del Mar Concours d’Elegance, the NTNOA’s 2012 Lake o’ the Pines bike show, and the AMA vintage days at Mid Ohio. As of today there are 51 miles on the odometer. It starts runs, rides, and stops like a 1936 British motorcycle. Everything on it works as well as it ever did when new, perhaps even better. The front and rear tires are new Avons. The front is a speedmaster, the rear is a safety mileage. The sidecar has an original Dunlop sidecar tire, which was difficult to obtain. The sidecar tire is in good enough shape to ride. In the trunk of the sidecar there are some neat accessories that make this restoration stand out. There is a Brough Superior tool kit (original tools, newly produced tool roll) and a Lucas lightbulb holder. 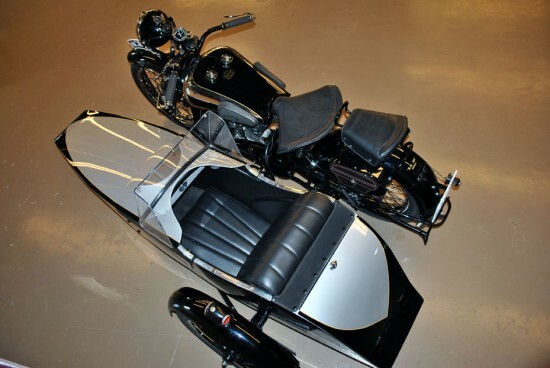 There is a top for the sidecar also stored in the trunk. It easily snaps on and off. 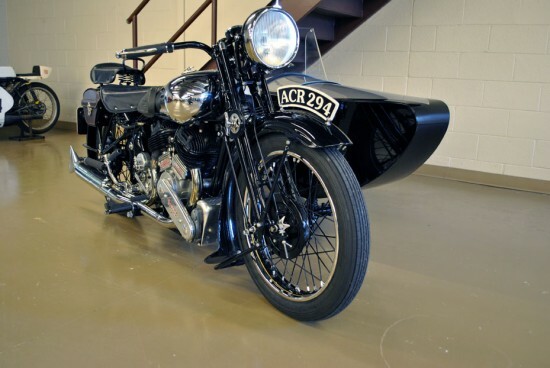 No shortcuts were taken, and no expenses spared on restoring this Brough Superior. A lot of time and hard work went into the motorcycle you see here. Some photos show the motor rebuild in process, some of the bike before, and finally the finished bike after restoration. You might think that “hey, this thing has a sidecar! It’s no sportbike!” well, considering that Brough offered a “sports” model sidecar, held a speed record with a sidecar-equipped machine, and were, in general, considered to be the very best motorcycles available anywhere at the time, we’ll give it a pass. This one appears to be powered by a Matchless engine, but I’m not well-versed in Brough-lore, so real or imagined experts should feel free to clarify for me in the comments! 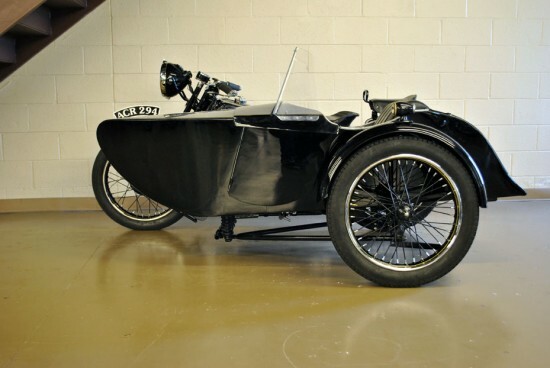 The sidecar is not the original item: none was found with the bike, but one was specified in the original documentation, so a period-appropriate example was restored to match.